1. Gum, Mints, and/or Mouthwash Strips – I always feel super bad when I meet someone with bad breath because I know it can give a negative first impression, and most of the time I don’t exactly know the person well enough to offer them gum or mints with a sheepish smile. As such, I might be juuust slightly paranoid of having bad breath myself since we often meet friends for a meal or movie. So, I always have gum, mints, or mouthwash strips in my purse to help make sure my breath is always minty fresh. Plus, I really can’t stand my mouth feeling dirty and I don’t exactly want to brush my teeth in a public bathroom. 2. Hair Ties – Right before I started Kindergarten, my mom decided to have all my hair chopped off. Yes, it did grow back better than the wispy knotted mess it once was. But, when I started school I was constantly asked if I was a boy or girl which has resulted in me never ever cutting my hair short since. Honestly, it’s more so because my hair is my favorite physical feature and something I’m always complimented on. However, my long thick hair doesn’t always behave, so sometimes it just needs to be put into a bun or ponytail. Yes, I do have to constantly buy hair ties because they go missing or become cat toys. With my thick hair, I prefer the flatter hair ties as they seem to catch my hair less for less damage and split ends. 3. U by Kotex® Liners – Okay, I hope this isn’t TMI, but I’ve never had overly regular periods. Sometimes things down there are a little more active than others, too. 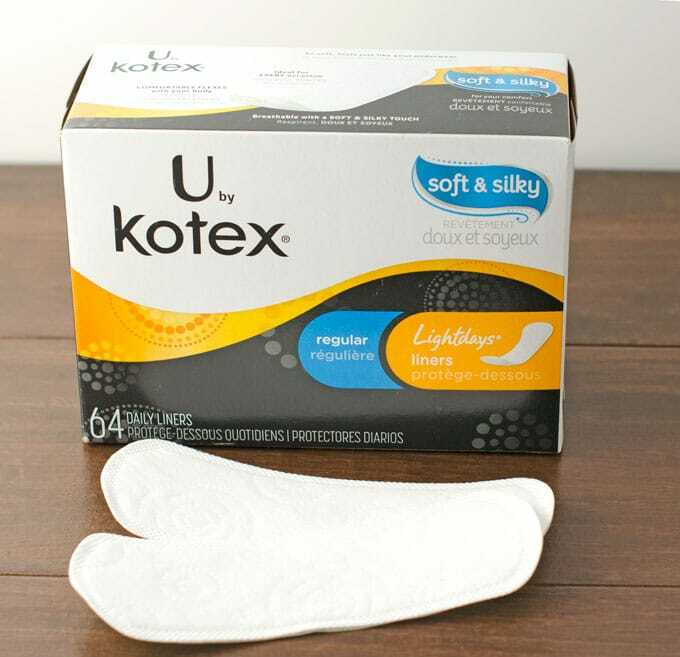 While I’ll take that over having to deal with dryness any day, sometimes you just need a liner and U by Kotex® Lightdays® Liners are my favorite. They get the job done while being lightweight and super slim to easily carry in your purse. No constantly wearing a diaper feeling here, thank you very much. They also really are soft and silky. So much so that when I first picked one up I almost wanted to rub them against my face, if that weren’t a totally weird thing to do, of course. Anyway, if you’d like to try out these liners yourself, be sure to grab this $1 off U by Kotex® liners coupon to save some money to buy those hair ties that always go missing. Whenever we move I totally expect to find approximately 300 under the couch. 4. A Bottle of Water and a Snack – Ever since I started implementing healthier habits a few years ago, I drink a ton of water. So, I always like to have a small battle of water in my purse in case I get stuck in traffic or don’t want to pay $5 for a bottle of water if I feel parched. Being hangry isn’t fun for anyone either, so I also keep a shelf-stable snack in my purse like a granola bar or a bag of mixed nuts. 5. Lip Balm – Winter is coming and one of the things I hate most is having dry lips. I have a bad habit of licking my lips if they feel a bit dry, which, turns out, just leads to dryer lips that are more prone to chapping and cracks. Bleh. As such, I always have a lip balm, or 20, in my purse. What are some of your must-haves for staying comfy and confident on the go? I totally agree with your items! Lip balm, feminine products, hair clip, spare pair of contacts, and gum are definitely my favs!